This page contains information and discussion about the content management system at http://iliveoverhere.com/ that can be used to enter information for the app. The content management system that we use is a customized version of the free Wordpress blogging platform. Wordpress is very flexible. If there is something you find inconvenient or you have other ideas please mention it here and something can probably be done about it. This is work in progress and all input is valuable. For the general public, the site I Live Over Here can be used to browse all of the locations that schools have entered. The site has a Locations menu that can be used to open the top level page for all of the different towns that currently have locations. For registered users (ie. the schools who are creating an app in this trial), the site I Live Over Here can also be used to enter new locations. Use your private username and password that we've supplied to log in. After logging in, you'll enter the Dashboard, whicj is the place where you can manage your locations. You will see the Dashboard menu on the left of your browser window. Your Dashboard has 6 items: Posts, Locations, Media, Comments, Profile, and Tools. The Posts -menu item can be used to write blog posts for the site. The Locations -menu item is for managing all of your locations. The Media -menu item can be used to browse all of the photos in the site. The Comments -menu item can be used to browse and edit the comments to the blog posts (commenting has been disabled for the locations). The Profile -menu item is for setting information about you (email, website, biographical info, etc.). The Tools -menu has various tools based on who is logged in. At any time you can click the I Live Over Here -link in the top left corner. Clicking it will hide the Dashboard and you will see the site as it appears to visitors. The only indication that you are still logged in is the narrow dark gray stripe that shows your username. From the your username -menu you can get back to the Dashboard or you can log out. The Locations -menu has two items. Manage will show a list of all of your locations and New will allow you to enter a new location. When you select the Manage -menu item you will see all of you locations. Move your mouse pointer over any of the location names and you can edit or trash the location post. If you throw something to trach by accident you can always restore it later by selecting Trash from the top menu (shown on the right). Initially, when you have no locations, you can see all of the locations in the system. After you make your first own location, you will only see your locations in the Manage Locations area. In the Edit Location area you will enter all of the information about the new location. First you will enter a title for the Location. The title will be used in the Content Management System and it will not be sent to the app (the field called Name of the location will be sent to the app). The big text area below the title is for the description and you should just type text there without any formatting. The MapPress field is for showing where the location is on the map and for entering coordinates. Press the New Map button to show the map interface. There are three ways to enter locations. 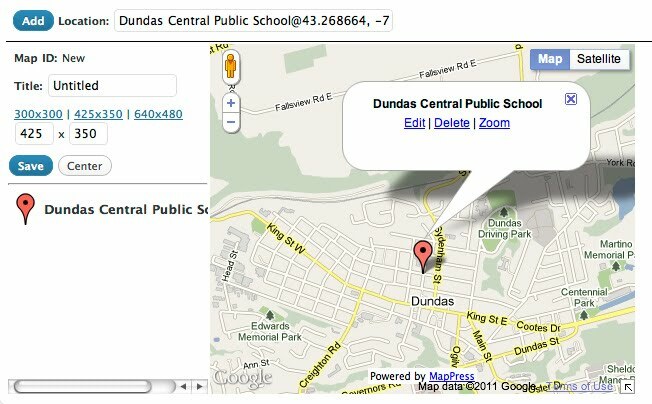 To enter a location by address type the address in the Location field and press the Add button. You can also enter the same location by latitude and longitude. In all three cases the same information will be sent to the app (the latitude and longitude coordinates). Please note that after adding a location for the map you can move it around if the original position is not the right one. You can only have one location marker per map. If you make a mistake, hover with your mouse over the name of the map on the left hand side and the links "Edit / Insert into post / Delete" will appear. Please don't use "insert into post." You can delete the map and create a new one, or edit the current move to drag the marker around. The name of the map will NOT be used in the app. Below the map are the content fields that you can fill in with information about this location. Fields that are marked with a little red star are required fields and you cannot publish the location post while those fields are still empty. All of the fields have a small info button next to them that you can use to get more information about that field. Just move your mouse over the little "(i)" icon and a little popup will have more text about how the information is to be entered. You can at any time save your location post as a draft or you can publish it for everybody to see. The Save Draft and Publish buttons are on the right side of the title field. Beside every image field is a Set Image link that opens the Flash uploader or the Browser uploader. The Flash uploader allows you to select multiple files to be uploaded in one pass. However, if you don't have access to using Flash, the Browser uploader works fine, although you will be required to upload one image at a time. The instructions here are for the Browser uploader. You can switch from the Flash uploader to the Browser uploader by selecting the Try the Browser uploader -link. The browser uploader window has three menus at the top. You should always add images using the options From Computer or Media Library. The Media Library option means that you can choose from images that have already been uploaded to the the content management system. For all new images you have to use the From Computer option. When you press the Select Files button you will get the standard file dialog of your operating system to choose a file from your computer. When you have uploaded the file you will see a small thumbnail of the image and information about it. There are also fields for entering title, alternate text, caption, and description but none of those are currently used by our system. You can enter information for the fields if you like but it is not necessary. The Alignment selection has no meaning in our implementation, so it does not matter what you select. The Size option is important and you should select Full Size. 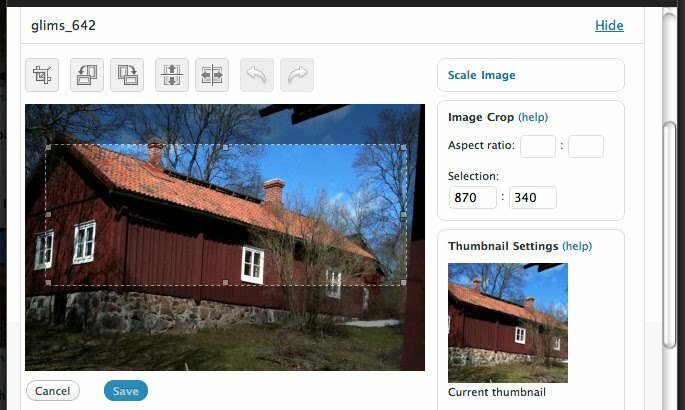 This is also a good way to make sure that the image you are about to select has the right dimensions as the dimensions in parentheses below the Full Size radio button are the actual dimensions of the image. When everything is in order you can select the Set image in field link so save the image in this field. When you have entered all of the information you can Publish the location post or you can use Save Draft to save it without publishing. You can later find this and all of your other locations by selecting the Manage option from the Locations -menu item. When you set the image fields you will se a small thumbnail picture of the image that you uploaded. You will not immediately see if it has the right dimensions. Only after you select Publish (for new Locations) or Update (for old locations) will you get information about the images that you have uploaded. If the an image has the wrong dimensions, there will be a red notifications next to it. Below the notification you can see what is wrong. 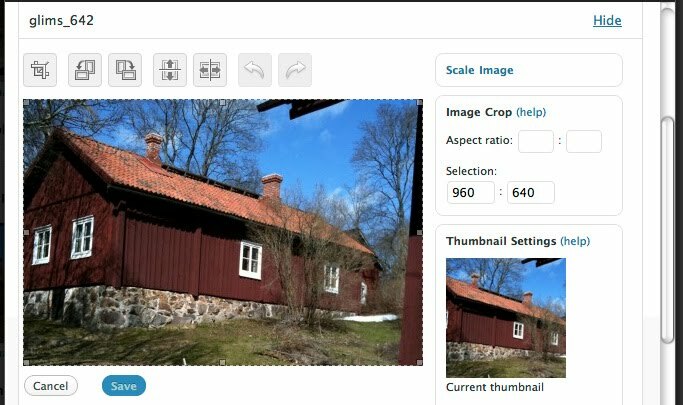 If the actual image size is just a little bit too wide or high you can easily crop the image in WordPress using the Media Library. From the menu at the top of the Browser Uploader you can select the Media Library link. Select the image that you want to edit by clicking the Show link next to it. Now you are ready to edit the image by selecting Edit Image. There are other ways to access the Media Library. One way is to use the Media menu item in your Dashboard. Now you will see that there are values in the selection fields (in this case 870 : 340). The values should be 960 : 640 and you can just edit the fields. You can't edit the fields without first selecting an area in the image. Once you have the correct values you can move the selection in the image with arrow keys. For information about this you can select the (help) link.